Sometimes a person needs to accurately indicate the metals in the periodic Table. As the man who practically owns the chemistry, can determine whether a particular element of metal? Take the periodic table, and with a ruler draw a line that starts in the cell with the element Be (Beryllium), and ends in a cage with the element At (Astatine). The items that will be on the left of this line are metals. And the "below and to the left" is the element, the more pronounced metallic properties it has. It is easy to verify that in the periodic table so metal is France (Fr) is the most active alkali metal. Accordingly, those elements which are right of the line, have properties of nonmetals. And here, too, a similar rule applies: the more "up and to the right" of the line is the element, the more powerful it is nonmetal. The element in the periodic table is fluorine (F), the strongest oxidizer. He is so active that the early chemists gave him a respectful, though unofficial, nickname: "All razrezami". There may be questions like "But what about those items that are on the line or very close to it?". Or, for example, "the"top" of the line are chrome, manganese, vanadium. Is it a nonmetal? After all, they are used in the production of steel as alloying additives. But we know that even small impurities of non-metals make the alloy fragile." The fact that the elements located on the line (for example, beryllium, aluminum, titanium, germanium, niobium, antimony) are amphoteric, that is, a dual nature. As for example, vanadium, chromium, manganese, are the properties of their compounds depends on the oxidation state are the atoms of these elements. For example, such higher oxides like V2O5, CrO3, Mn2O7, have pronounced acidic properties. That is why they are the seemingly "illogical" places in the periodic table. In pure form these elements, of course, are the metals and have the properties of metals. The periodic law is the basis of modern chemistry and to explain the patterns of change of properties of chemical elements, was discovered by D. I. Mendeleev in 1869. The physical meaning of this law is revealed in the study of the complex structure of the atom. In the XIX century it was believed that atomic mass is the main characteristic of the element, therefore for the classification of substances used it. Now the atoms and identificeret determine the magnitude of the charge of their nuclei (protons and ordinal position in the periodic table). However, atomic mass of elements with some exceptions (for example, atomic mass of potassium is less than the atomic weight of argon) is increased in proportion to their nuclear charge. With increasing atomic mass and observed periodic variation of properties of elements and their compounds. This metallicity and nemetallicheskie of atoms, atomic radius and volume, ionization potential, electron affinity, electronegativity, oxidation States, physical properties of compounds (boiling point, melting point, density), their basicity, or acidity afternote. The periodic table graphically expresses which he discovered the periodic law. 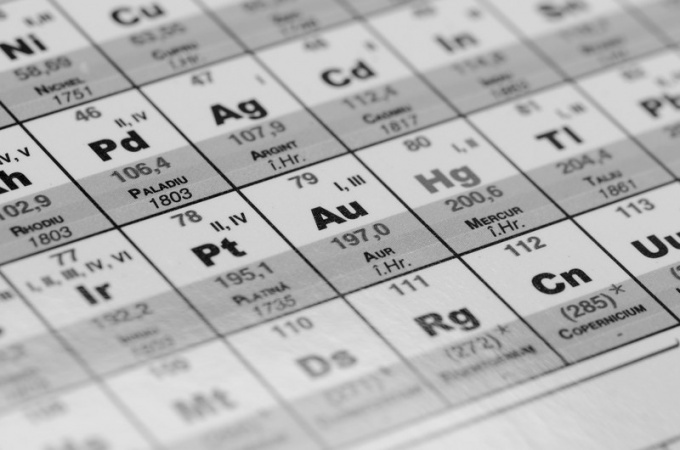 In the modern periodic table contains 112 chemical elements (last – Materi, Darmstadt, Rentgene and Copernici). According to recent reports, opened and the next 8 elements (up to 120, inclusive), but not all of them got their names, and these elements are still few publications are present. Each item occupies a cell in the periodic table and has a sequence number corresponding to the charge of the nucleus of its atom. The structure of the periodic system represented by seven periods, with ten rows and eight groups. Each period starts with alkali metal and ends with noble gas. The exception is the first period starts with hydrogen, and a seventh incomplete period. The periods are divided into small and large. Small periods (first, second, third) consists of a single horizontal row large (four, five, six) – two horizontal rows. The upper rows in the larger periods are called even, lower – odd. In the sixth period of the table after lanthanum (number 57) there are 14 elements, similar properties for lanthanum, the lanthanides. They are made in the lower part of the table separately. The same applies to the actinides, after actinium (#89) and largely repeating its properties. Even-numbered rows of large periods (4, 6, 8, 10) is filled just metals. Elements in groups show the same higher valence in oxides and other compounds, and this value corresponds to the group number. Main groups contain elements of small and large periods, the side – just big. Top to bottom the metallic properties are intensified, non – weakened. All the atoms of the side sub-groups – metals.